In the aftermath of Muammar Gadaffi’s death, Josephine Forster considers a disturbing pre-occupation with the gory details of death. Josephine is a freelance journalist studying MA Newspaper Journalism at City University. The Greek tragedians rarely portrayed death on stage: either they had squeamish audiences or they lacked the technology to make it convincing. Not modern problems, to judge from the images of Gaddafi’s bloodied body plastered across newspapers and the internet hours after his death. The events of the Arab Spring have been acted out on a worldwide stage with startling immediacy thanks to mobile phones and the internet. Images captured by protesters have borne unavoidable witness to every abuse of power, every death. In the wake of Bin Laden’s killing, the Obama administration’s decision not to release photos of his body was met with almost incredulous anger and scepticism. If we did not see, how could we believe? To claim that we need images to know the truth clearly rings false. Pictures can lie, just as words can. The vast majority of us know Bin Laden’s face only from grainy propaganda videos. We are certainly not better equipped to identify his body than the CIA, with its reserves of DNA samples and decade of single-minded pursuit. In Saddam Hussein’s elaborately staged trial, images of his unkempt hair and dirty clothes were used to systematically humiliate the dictator brought low. Television audiences heard the evidence of his crimes, listened to his sentence, watched the noose being put around his neck. And even that was not enough. Within hours, a leaked phone video revealed each twitching contortion of his body, his defiantly uncovered face twisted in death. So what is behind our obsession with seeing? The sensationalist coverage of Gaddafi’s last moments, blow-by-blow, in the popular press resembled nothing so much as a gory stage drama. Death at the hands of the mob, a fitting end for the tyrant. But it seems we have forgotten how to separate theatre and reality. Aristotle wrote that at the climax of a tragedy there is catharsis, a purging of negative emotion. The audience emerges cleansed. The constant stream of images emerging from the Arab Spring has made us an audience, too, but we seem closer to the spectators at the Roman arena, cheering on gladiators as they battled to the death. 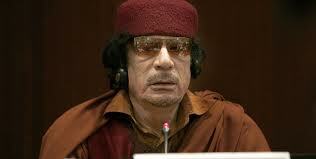 The coverage of Gaddafi’s death has been an exercise in voyeurism disguised as news reporting. On Friday night, as European and US leaders welcomed news of Gaddafi’s death, the UN quite rightly called for an investigation into the apparent murder of a prisoner of war. There are rules, after all, about how we treat other people. There are also rules about how the media should cover people in distress, laid down by the much-maligned Press Complaints Commission. They call for ‘sympathy and discretion’ as well as sensitive publishing. It’s hardly news that the mainstream media tramples all over the PCC code of practice, but it is distressing to see it revelling in the spectacle of a man – any man – utterly stripped of rights and dignity. It is shameful that the gory details, the desire for vengeance, were more important than justice. Gaddafi was an easy person to hate. The fury and ecstasy of those on the ground in Libya are understandable. The joy of some relatives of Lockerbie victims is understandable – they feel deeply and personally affected by this death. But law exists to protect even the worst of individuals from the hatred of the mob, and perhaps also to protect us from ourselves. The UN inquiry will examine the actions taken in Sirte, where the National Transitional council failed to prevent a breakdown of law. There should also be an investigation into how we became an appreciative audience to the gruesome death of a fellow human being. It may have happened hundreds of miles away, but it was transported almost instantly onto our screens and front pages. We may not have taken an active role, but neither did audiences at the Colisseum. How much more disgusting is it to glory in such horrors as spectators, from afar?